This is such a simple dish but it's really good. If you haven't made it yet... well what are you waiting for? 1. Cook the gnocchi in a pot of boiling, salted water. 2. Meanwhile, start making the ratatouille. Saute the onions, with the garlic and mushrooms, until see-through. Add the egg plant, and stir-fry for about 5 minutes. Add the baby marrows, cook for another 5 minutes, finally adding the tomato. Season well with salt, pepper, a pinch of sugar and herbs. 3. Simmer, with the lid on until everything is soft and the tomato has formed a sauce. 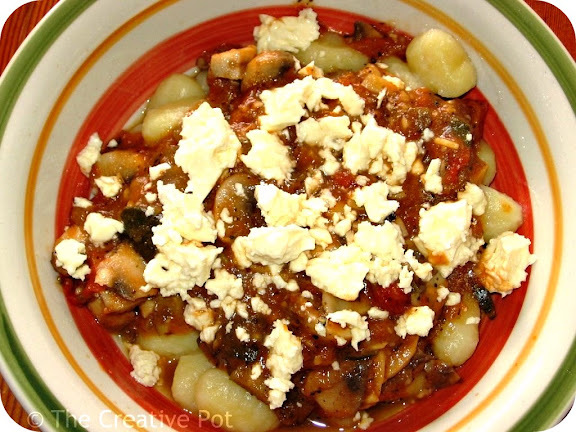 Add olives, and serve over gnocchi, with feta cheese sprinkled on top. TIP: For a quicker version - use a tin of ready-made ratatouille. Heat it up with a teaspoonful of chopped garlic and some herbs and continue as above.